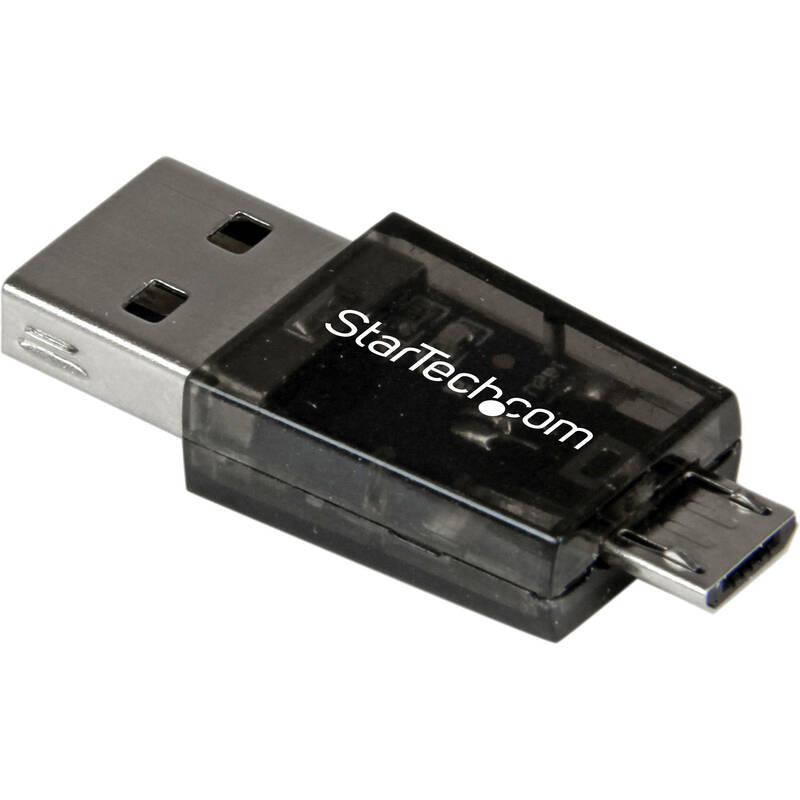 The microSD to Micro-USB/USB OTG Adaptor Card Reader from StarTech lets you turn a microSD card into an external USB storage solution that can interface with any USB-enabled computer or OTG-enabled device, such as Samsung Galaxy smartphones and tablets. Expand the storage capabilities of your OTG-enabled smartphone or tablet, by creating an external storage device that you can also connect to your USB-enabled computer, and transfer files from one device to another with standard USB and Micro-USB interface options. Box Dimensions (LxWxH) 4.0 x 2.9 x 0.8"
microSD to Micro-USB/USB OTG Adaptor Card Reader is rated 4.0 out of 5 by 4. Rated 1 out of 5 by merpmerp from Broke this and the microSD card before I could even use it Maybe it's my fault. I don't know, I'm not super technical but I'm usually ok with using things like this. I never had a micro sd card before. I bought this adapter and put the card in. Maybe I put the card in backwards, I don't know if it can go in backwards. If it can, I don't think that is a good design. Anyway, it got stuck all the way down in the adapter. Trying to get it out I ended up busting the adapter and the micro sd card, so there's $40-$50 down the drain. I purchased a new micro sd card, but this one came with an adapter the size of the normal SD card. So, I put the micro SD card in the normal size adapter, then put that adapter into a USB adapter that is equipped to handle that. I guess I should have done that first time. You live and learn. Hopefully someone else can benefit from my experience. Rated 5 out of 5 by kurt l. from Great little device Great little device to have on hand at all times! I randomly found this when ordering a new MicroSD for my phone, and love the thing. I've only used it a couple times, but this is by far the most all-around useful otg storage accessory -aside from the actual storage medium, of course. Rated 5 out of 5 by Charles from Usefulness comes in a small package. Usefully in every way. This is not a SD card adapter, this is an OTG adapter. It depends on which device is connected to the other end. I transfer data and photos back and forth from my Note 4, so if your phone has a micro USB and is android I would assume that you can. I use this device all the time since I got it about 3 weeks ago, and you can also use it to transfer data thru a micro SD card. Best of luck, I hope it works for you as good as it is working for me. what is the max size of memory card it can support, is it supports 128GB micro SD card?